These Terms and Conditions set out the terms on which you (on behalf of yourself and any person on whose behalf you are booking, together "you" or "your") book through Australian Cruise Group Pty Ltd ABN 89 152 554 302 (referred to as, we, us and our, in these Terms and Conditions) for all bookings, reservations, products and cruises operated by us including Sydney Showboats, Magistic Cruises, Cruising Restaurants of Sydney, Magistic Events, and any other cruises, websites, operations or entities operated by us or a third-party. These Terms and Conditions constitute the agreement between you and us. The law of New South Wales governs this agreement and the parties agree to submit to the jurisdiction of the courts of New South Wales in respect of any Dispute arising between them. Terminate the Charter by berthing the vessel at the nearest safe location and disembarking the passengers. Summon the police to remove offending passengers. Negotiate with the Charterer to agree on some other course of action to resolve the issue. Any costs associated with the early termination of the Charter due to unruly or rowdy behaviour must be paid by the Charterer. At the time of booking a cruise, you can either pay for it in full or go for a partial deposit (applicable only in case of group bookings of 8 guests or more). Once booked and paid for, all cruise tickets may be transferred at our discretion. Any requests to transfer a booking to another date or time must be made 72 hours prior to the cruise time, are subject to availability in the class and any promotional price of your booking and will incur a $10 transfer fee per person, each time a request is made. If in our discretion we agree to any transfers to a different class or promotional price, you must pay the difference between the original booked price and the price of any transferred booking. No agreement will arise between you and us until we have received payment at the time of booking in accordance with this clause. All group bookings require a 20% deposit in order to confirm the booking and full payment and confirmation is required 21 days prior to the cruise. Group bookings and cancellation policy: A group booking is any booking greater than 8 passengers (including adults and child). 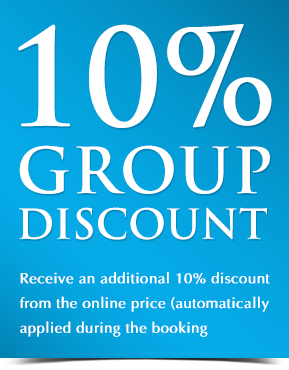 All group bookings need a 20% deposit at time of reservation to confirm your booking (except for special event cruises, including New Year’s Eve, Vivid Cruises, etc). The balance payment is due 21 days prior to cruise. The following cancellation fees apply from there onwards. Prior to 14 days, deposit is forfeited. 14 days – 8 days prior to cruise date | 50% cancellation fee of the total cruise charges will apply. Less than 7 days | 100% cancellation fee of the total cruise charges will apply. The charter is supplied subject to these charter terms and conditions provided to you with a cruise proposal and quotation. Payment of the deposit in accordance with the cruise quotation/confirmed booking (invoice) constitutes your acceptance of the charter terms and conditions. The charter price includes the Vessel, crew, and all other costs related to operations of the Charter such as fuel, docking and navigation route charges. Pricing in this Charter Agreement is based on the number of guests specified above. The full charter price applies based on the number originally advised by the Charterer even if the number of guests is less than that number, however in this case the Operator’s representatives will discuss this with the Charterer. The charter price is based on the day and the season of the booking. If the Charterer requests a change to the date, the duration of or inclusions in the Charter and the Operator in its absolute discretion agrees to such changes, the Operator will notify the Charter of any changes to pricing (including due to any change of the day or the season on which the Charter will operate). The Operator must pay the Charterer the amended price. Any change of date is subject to availability of the Vessel and at the absolute discretion of the Operator. The Charterer must pay the charter price in full at least 14 business days prior to the date of Charter, otherwise the Operator will not operator the Charter. The Charterer must pay the balances owing if the actual number of guests on board is higher than the final number of guests advised 7 days prior to the function and the amount for any consumption bars at the conclusion of the Charter. These amounts must be paid on board the Vessel at the conclusion of the Charter. Payment must be made by credit card or company cheque (subject to prior written agreement). No refund is given if the actual number of guests is less than the final number of guests advised to the Operator by the Charterer 7 days prior to the Charter. The final number of guests, cruise times, menu and beverage selections, entertainment requirements, embarkation location and balance of payment must be notified or paid (as the case may be) by the Charterer at least 7 business days prior to the Charter date. If the Charterer cancels the Charter at any time, the Charterer must pay the cancellation fee specified below, and the Operator is entitled to retain the Cancellation fee. Where the Cancellation fee is greater than the Deposit, the Charterer must immediately pay the Operator the difference between the Cancellation fee and the Deposit. If the Operator cancels the Charter, a full refund will be given and the Operator has no further liability to the Charterer for such cancellation. If the Charter is postponed by the Operator due to unsafe conditions (including due to a weather warning issued by the Bureau of Meteorology for Sydney Harbour, or other conditions considered unsafe by the Captain) then it will be rescheduled for the next available date suitable to both the Operator and the Charterer. The decision to postpone a Charter is at the sole discretion of the Operator and the Operator has no liability to the Charterer for such cancellation. The Operator will nominate appropriately qualified person(s) to be in charge of the Charter and the Vessel for the duration of the Charter, referred to in terms & conditions as the Captain and the Cruise Director. The duration of the Charter includes the time taken to embark and disembark members of the Charterer's group. This is limited to one point of embarkation and one point of disembarkation unless otherwise agreed in writing. The Operator is not responsible for any delays caused by the late arrival of members of the Charterer's group or delays at the wharf caused by crowds, the arrival of other vessels, ferries or any other item beyond the Operator's control. The Operator is not responsible for delays at the point of disembarkation for reasons outside its control. The Operator reserves the right to berth 10 minutes prior to the scheduled time for disembarkation. If necessary, any music or other entertainment will cease at such time. If the time taken for disembarking passengers takes longer than 20 minutes beyond the scheduled end of the Charter, the Charterer will be charged for this time pro rata to the vessel charge as set out above in respect to Cruise Extensions. If the Captain is required to vacate the disembarkation point in order to let other vessels berth, this time will also be charged at the same rate. It is the responsibility of the Charterer to inspect the nominated Vessel prior to the Charter to determine the Vessel's suitability. The Charterer represents and warrants to the Operator that the Charterer is satisfied with the Vessel and the standard of services offered by the Operator to be provided in respect of the Charter. The Operator will provide the nominated or substitute Vessel to the Charterer at the time of Charter in any specified condition agreed in writing. If the Operator agrees that the Charterer may decorate the Vessel, this must be done without the use of pins, adhesive tape, tacks or anything which will leave a mark on the Vessel. In such case, decorations will take place at a mutually agreed time. The course to be undertaken during the Charter may be agreed in advance with the Operator or with the Captain. The Operator reserves the right, at its sole discretion or that of the Captain, to vary the agreed course because of weather, wave height, traffic, vessel survey restrictions, or any other cause which the Operator or the Captain believes is justified in the interests of the comfort or safety of passengers, crew, the Vessel and other vessels. The Operator may substitute another vessel for the specified Vessel in the case of any unforeseen circumstances (including mechanical breakdown). In such cases, the Operator has no liability to the Charterer for such substitution provided that the substituted vessel satisfactorily meets the Charter particulars and provides the level of services as originally agreed. If requested by the Charterer and then if agreed by the Cruise Director and the Captain in their absolute discretion, a Charter may be extended on the day of the Charter. The Charterer must pay for any extension based on the hourly rates as specified. The Charterer must also pay an additional hourly rate for any organized entertainment on a pro rata basis and for beverages per person on a pro rata basis (being the original price per person divided by the original number of hours for the Charter, multiplied by the number of hours or part hours by which the Charter is extended). This must be paid on board with any other outstanding amounts at the conclusion of the Charter as specified in the Balance of Payments. The Charterer is liable for any damage to the Vessel, equipment or furnishings caused by the Charterer or any member of the Charterer's group, unless caused by the Operator's negligence. If the Operator repairs any damage itself, the Charterer must pay the Operator the reasonable third party costs of carrying out such repair. The Operator is not liable for any loss or damage suffered by any person. This does not apply to liability for the Operator's negligence arising from the Charter. The Charterer is responsible for any such claims where the Operator has no liability. The Operator accept no responsibility for loss or damage to goods brought onboard and or left on the Vessel or the Operator's premises prior to, during or after the Charter. Neither party is liable to the other party for consequential loss or damage. The Operator's liability for breach of such guarantee, term, condition or warranty is limited to the supply of the relevant Charter again or the cost of re-supplying the Charter.